Do you think parents should have a favorite child? Just asking. No judgment here. It’s a strange question on Teapot Tuesday, isn’t it? But a valid one since today’s teapot is a gift from one of my daughters. Hey–wait just a cotton picking minute. I don’t have any daughters, do I? I do have a beautiful daughter in law now but that is not the daughter I was talking about. When we were on a blogging event with the North Iowa Bloggers someone mistook Chris and I for the parents of a couple of the bloggers and the story has unfolded over time. It has been embellished upon and exaggerated over recent months and my two daughter status has expanded into something like 15 daughters. It’s all good. Especially when they give me teapots. 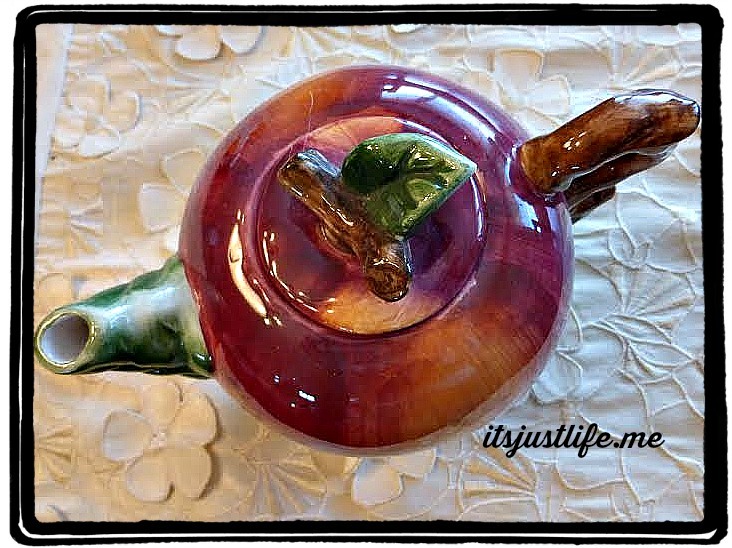 Donna, one of the “Original Daughters” who blogs at DonnaHup.com went thrift store shopping and found me this lovely apple one cup teapot and cup combo. I love it. She knew I would and she was so excited to bring it to me and share. Since it is quickly become fall it seems time to share it once again. 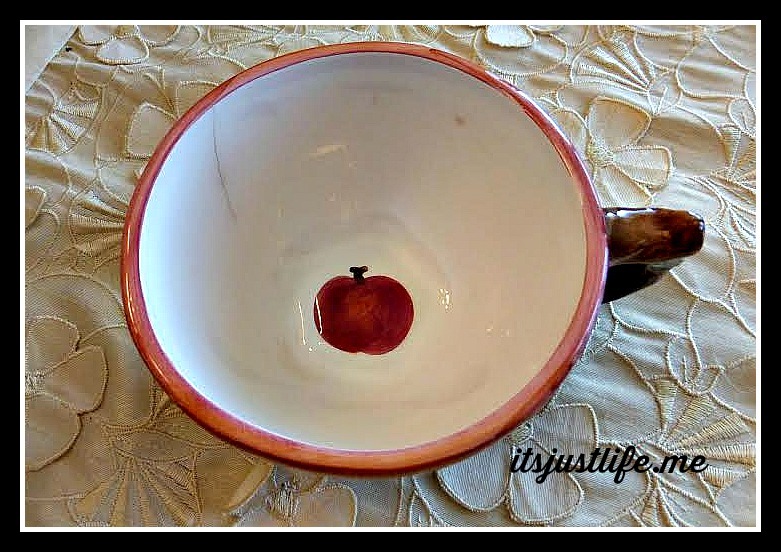 How cute is that apple in the bottom of the cup part of the teapot set? I must admit it was a bit bittersweet because just weeks before we had gone thrift store shopping with our friend, Amy, who was tragically killed in an automobile accident during a horrible winter snowstorm. All of the North Iowa Bloggers continue to feel the loss and miss her every day. When Donna gave me this teapot it reminded me of our thrift shop fun with Amy –what great memories. I love any teapot that anyone gifts me and it just made me smile to see how excited Donna was when she gave this perfect little apple teapot to me. I love it and I love the fact that everyone thinks of me when they see a teapot these days. That is so precious! I’m sure it brings back wonderful (and bittersweet) memories of your Iowa blogging family. It does indeed, Dianna. I thought your post on your “brother” was so sweet and touching. Thinking of you during a very difficult time. 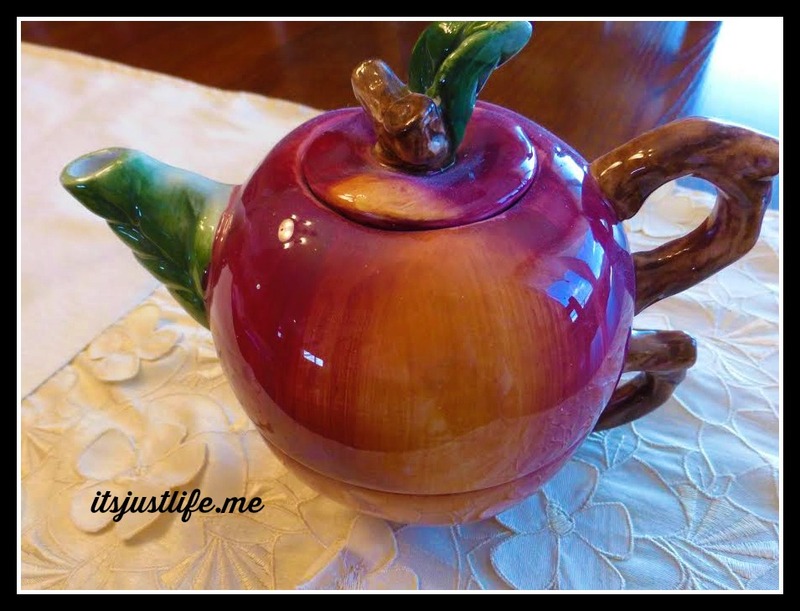 This teapot would be perfect with your apple dip!! I think it is great that you have some “daughters” who think of you when they see a teapot you would like. Daughters do things like that. That’s a cute one! And perfect for this time of year! It goes along with everything fall, doesn’t it? We were in an antique shop in Buffalo, MN, yesterday when I spotted a row of teapots and instantly thought of you. See how you’ve drawn all of us into your love of teapots. 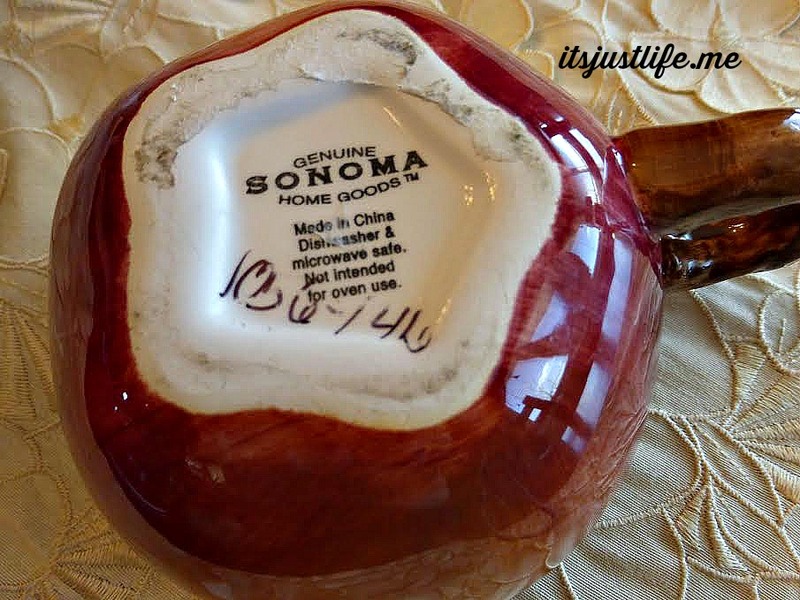 I do love this apple one and the bittersweet memories it brings back for you. Thanks so much! Glad we are reconnected again!